The Ozanam Holiday Centre is set on four acres in Mornington, County Meath, and is only a 10 minute walk to a beautiful beach and from the River Boyne where St Patrick is said to have landed. The Ozanam Holiday Centre has 31 twin rooms, all en suite. The building is on ground level making it very accessible for those with mobility problems. During the summer months weekly full board is offered to the over 50’s, which includes in-house entertainment provided by five and six piece bands with nightly dancing and singing. Ozanam Holiday Centre has a relaxing sun room with a library and a TV lounge with widescreen TV and DVD player, an Oratory for guest use and where Mass is celebrated weekly. The bar in the sunny dayroom where their nightly entertainment takes place is open at lunch time and each evening refer to the website for exact opening times details. Amenities include a landscaped patio garden with a relaxing water feature, and all-weather bowling green and all weather golf putting surface. Other activities include pool and croquet. A kitchenette with tea and coffee facilities is available 24 hours a day. 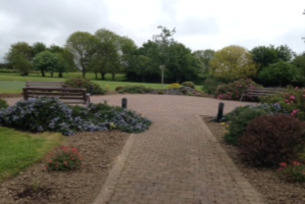 Ozanam Holiday Centre is open all year round and has a HSE day care centre which operates from Monday to Friday, the centre is available for midweek or weekends from September to May for group meetings, Meditation and Mindfulness, Yoga, Pilates, Wellness, Retreats, Art, Fitness and Golf Weekends etc. The medieval town of Drogheda itself hosts Millmount museum, St. Peters Church containing the relic of St. Oliver Plunkett, Laurence Gate the Highlands Gallery, Beaulieu house and gardens and much more. The Ozanam Holiday Centre is an ideal base to visit the many Historical attractions in close proximity including Bru Na Boinne, Newgrange interpretive centre, Battle of the Boyne Oldbridge Estate, Mellifont Abbey, Monasterboice, The hill of Slane where St. Patrick light is pascal fire at Easter 433AD. For the golf enthusiasts Laytown and Bettystown Golf Club one of the finest 18 hole links courses in Ireland with fantastic views of the East Coast and County Louth Golf Club or Baltray as it is known locally rated in the Golf Digests top 100 courses in the world as a hidden gem is just 4 miles from Drogheda. Sonairte, The National Ecology Centre in Laytown, Co Meath offers both Eco and Heritage Tourism with a beautiful nature trail and river walk.